Illustrations note XIV, 338 p.
I De Rham Theory.- II The ?ech-de Rham Complex.- III Spectral Sequences and Applications.- IV Characteristic Classes.- References.- List of Notations. 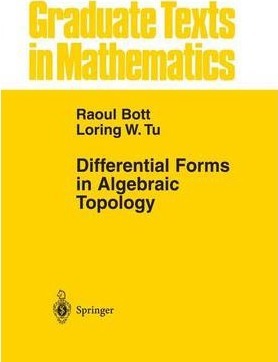 "Bott and Tu give us an introduction to algebraic topology via differential forms, imbued with the spirit of a master who knew differential forms way back when, yet written from a mature point of view which draws together the separate paths traversed by de Rham theory and homotopy theory. Indeed they assume "an audience with prior exposure to algebraic or differential topology". It would be interesting to use Bott and Tu as the text for a first graduate course in algebraic topology; it would certainly be a wonderful supplement to a standard text. "Bott and Tu write with a consistent point of view and a style which is very readable, flowing smoothly from topic to topic. Moreover, the differential forms and the general homotopy theory are well integrated so that the whole is more than the sum of its parts. "Not intended to be foundational", the book presents most key ideas, at least in sketch form, from scratch, but does not hesitate to quote as needed, without proof, major results of a technical nature, e.g., Sard's Theorem, Whitney's Embedding Theorem and the Morse Lemma on the form of a nondegenerate critical point." "This book is an excellent presentation of algebraic topology via differential forms. The first chapter contains the de Rham theory, with stress on computability. Thus, the Mayer-Vietoris technique plays an important role in the exposition. The force of this technique is demonstrated by the fact that the authors at the end of this chapter arrive at a really comprehensive exposition of Poincare duality, the Euler and Thom classes and the Thom isomorphism. "The second chapter develops and generalizes the Mayer-Vietoris technique to obtain in a very natural way the Cech-de Rham complex and the Cech cohomology for presheaves. The third chapter on spectral sequences is the most difficult one, but also the richest one by the various applications and digressions into other topics of algebraic topology: singular homology and cohomology with integer coefficients and an important part of homotopy theory, including the Hopf invariant, the Postnikov approximation, the Whitehead tower and Serre's theorem on the homotopy of spheres. The last chapter is devoted to a brief and comprehensive description of the Chern and Pontryagin classes. "A book which covers such an interesting and important subject deserves some remarks on the style: On the back cover one can read "With its stress on concreteness, motivation, and readability, Differential forms in algebraic topology should be suitable for self-study." This must not be misunderstood in the ense that it is always easy to read the book. The authors invite the reader to understand algebraic topology by completing himself proofs and examples in the exercises. The reader who seriously follows this invitation really learns a lot of algebraic topology and mathematics in general."